Formed at South Carlton on 28 September 1917 as a training unit, it was intended that it should be equipped with Camels and proceed to France in May 1918. Various deployment dates were then proposed and it equipment changed first to Dolphins then Snipes, but on 4 July 1918 it was disbanded. Further plans for its formation and deployment were proposed before it actually began forming at Wyton on 28 September. It was now to be a ground attack unit equipped with Salamanders, but the Armistice intervened and its formation was suspended. The squadron eventually formed on 18 December 1940 from No 422 Flight at Cranage as a night fighter unit equipped with Hurricanes. Tasked with the night defence of Merseyside and the Midlands, the Hurricanes were supplemented by Defiants in February 1941 and both types continued in use until March 1942, when the Hurricanes left. Two months later the Defiants were replaced by Beaufighters and in October the squadron moved to Honiley, having been at Wrexham for the previous year. From April 1943 the squadron also began intruder operations and two months later it was told to prepare for overseas deployment, at the same time beginning the conversion to Mosquitoes. With its conversion to Mosquitoes complete it was advised that its overseas deployment was cancelled and it continued its operations from Church Fenton until September when it moved north to Drem. It returned south to West Malling in November 1943 and during Operation 'Overlord' it provided night fighter cover over the beach-head. When the V-1 flying bombs began attacking Southern England, the squadron became heavily involved in the night interception of these devices. However, when the launch sites were over-run and the attacks abated, the squadron was considered surplus and disbanded on 12 December 1944. 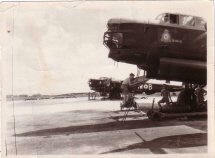 The squadron reformed at Leconfield on 30 December 1944 as a Halifax unit in Transport Command. In March 1945 the squadron was sent to India via Egypt, without its aircraft and on arrival at Cairo West received Dakotas, which were then flown to India. It trained for the delivery of paratroops and gliders but was mainly involved in general transport duties in and around Burma and the rest of South-East Asia Command. With the end of the war the squadron remained in India until 15 April 1946 when it move to Hong Kong, where it was disbanded by being renumbered No 110 Squadron on 15 June 1946. The squadron's final incarnation began on 17 November 1952 at Ahlhorn as a Meteor NF Mk 11 equipped night fighter unit in No 125 Wing, re-locating to Geilenkirchen in 1958, where it was disbanded on 21 January 1959 on being renumbered No 3 Squadron. Formed on 1 December 1917 at Waddington, it was employed as a training unit until moving to Netheravon in March 1918. Here it received operational equipment in the form of Handley Page O/400 heavy bombers, which it took to France in August where it joined the Independent Force. It operated in the strategic bombing role for the remainder of WW1 and returned to the UK in March 1919 and re-equipped with DH10s. These were taken to India in July, where it arrived in August, initially at Allahabad. It moved to Lahore in November and Risalpur in March 1920, but four days later the squadron was disbanded by being re-numbered No 60 Squadron on 1 April. The reformed, again in the night bomber role at Catfoss on 16 September 1935, equipped with Heyfords but soon moved to Boscombe Down. It moved back north to Leconfield in January 1937, where it became a training unit in June 1938. In February 1939 the Heyfords were replaced by Whitleys and in September it moved south to Abingdon, still as a training unit, where on 6 April 1940 it was disbanded into No 10 OTU. A new 97 Squadron began to form on 1 May by no aircraft were received and formation was cancelled on 20 May 1940. However, the squadron did reform on 25 February 1941 from a nucleus provided by No 207 Squadron at Waddington (its original birthplace) and was equipped with the Avro Manchester. Following a poor start due to the unsuitability of the Manchester's Rolls Royce Vulture engines the squadron received some Hampdens, which had left by August 1941. However, within six months the Manchesters had been replaced by the Lancaster and these were operated for the remainder of the war. In April 1943, the squadron was transferred to No 8 (Pathfinder Force) Group at Bourn, operating in the 'Marker' role, but unlike most units transferred to No 8 Group, No 97 Squadron was returned to its original Group, No 5 at Coningsby in April 1944, where it continued to operate in the 'marking' role purely for No 5 Group. Retained post-war, the squadron re-equipped with Lincolns in July 1946 and moved to Hemswell the following November, remaining there until disbanding on 1 January 1956. The squadron number was allocated to the Thor IRBM missile unit at Hemswell on 1 December 1959, disbanding on 24 May 1963. The following day a new 97 was formed by re-numbering No 151 Squadron at Watton. It was now operating in the Radar Calibration role as part of Signals Command equipped with Canberras, Hastings and Varsities. It disbanded finally on 2 January 1967. Formed at Harlaxton on 30 August 1917 as a day bomber unit from a nucleus provided by No 4 Training Squadron, it moved to Old Sarum the following day, where it equipped with DH9s. These were taken to the Western Front in April 1918, just in time to take part in repelling the German offensive of March. It next moved south to assist the French around Champagne in July and returned north to join the British offensive towards Belgium in August. The squadron returned to Shotwick in March 1919, disbanding there on 24 July. The squadron reformed on 17 February 1936 at Abingdon from a nucleus provided by No 15 Squadron. IT initial equipment was Hinds but these were replaced by Battles in June 1938, but was used as a training unit to provide crews for other Battle squadrons. As a result it remained in Britain when the other squadrons joined the Advanced Air Striking Force in France. However, it did go to France in April 1940, but was still retained in the training role. Following the German offensive, it was recalled to Britain in June, but lost many of its personnel in the sinking of the Lancastria. Reformed at Gatwick it was then sent to Iceland to provide coastal protection patrols around the country. Hurricanes were added to its strength in Jun 1941 but on 15 July the squadron was disbanded by being reduced in status to No 1423 Flight. The squadron reformed yet again in the light bomber role on 12 September 1942 at West Raynham as a Mitchell unit in No 2 Group. Operations began in January 1943 and these were maintained in preparation of the Allied landings in Normandy, which took place on 6 June 1944. Following the invasion, the squadron adopted a more tactical role in support of the advancing armies and in October 1944, re-located to Melsbroek in Belgium. In April 1945, the squadron moved onto German soil but in September went back to Belgium. Retained as part of the British Air Forces of Occupation, the squadron re-equipped with Mosquitoes in November 1945 and moved to Wahn in March 1946. In September 1949 it moved again, this time to Celle and then again in November 1950 to Fassburg. Here it received Vampire FB Mk 5s in February 1951, Venom FB Mk 1s in August 1953 and finally Hunter F Mk 4s in April 1955, moving to Jever and becoming a day fight unit at the same time. 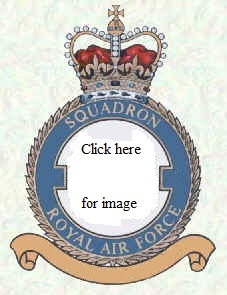 The squadron disbanded on 15 July 1957. The squadron next reformed on1 August 1959 as a Thor Intermediate Range Ballistic Missile unit at Driffield, disbanding on 18 April 1963. The squadron's final incarnation began the following day, when No 245 Squadron was renumbered. Based at Tangmere it was equipped with Canberras for use in the electronic calibration role. It moved to Watton in October 1963 and Cottesmore in April 1969, where it was disbanded on 27 February 1976. Western Front, 1918: Amiens: Lys: Atlantic, 1940-41: Fortress Europe, 1943-44: Normandy, 1944: France & Germany, 1944-45: Rhine. No 99 Squadron possibly holds the RAF record for the number of new types introduced into service, these including the Avro Aldershot, Handley Page Hyderabad, Hinaidi and Heyford, Vickers Wellington, Bristol Britannia and Boeing C17 Globemaster III. However, the squadron originally formed on 15 August 1917 at Yatesbury from a nucleus provided by No 13 Training Squadron with DH6s and BE2e's but in April 1918 it received DH 9s. 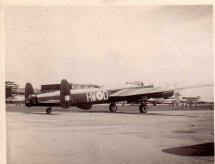 These were taken to France the same month where the unit joined the No 41 Wing in the day bomber role. In June No 41 Wing became part of the Independent Force and No 99 remained a component unit until the end of the war. In September 1918 the squadron began to receive DH9As and had been fully re-equipped by November. It was sent to India in May 1919 but just under a year later, on 1 April 1920, the squadron was disbanded on being renumbered No 27 Squadron. Four years later to the day, the squadron was reformed as a heavy bomber unit at Netheravon equipped with Vimys, which it took to its new base, Bircham Newton base in May. In August it received the first of the types it was to introduce into service, the Aldershot, although it was also to the only unit to operate the type. In December 1925 the Aldershots were replaced by the Hyderabad and a developed version of this aircraft, the Hinaidi, was gradually introduced between October 1929 and January 1931, when the last Hyderabad was retired. Yet another new type was introduced in November 1933, when a third type from the Handley Page stable was introduced, the Heyford. This was the RAF's last biplane heavy bomber and when 99 introduced yet another new type to service, beginning in October 1938, it was a a monoplane from Vickers called the Wellington. The squadron was to operate the Wellington through various marks until November 1944, initially as part of Bomber Command, and from June 1942 in India. Here it continued to operate in the night bombing role, but now against targets in Burma. The Wellingtons began being replaced in September 1944 by Liberators, but it was November before the last one left and the squadron now carried out longer range bombing missions and from July 1945 these were conducted from the Cocos Islands, where the squadron had moved in preparation for the invasion of Malaya. However, when this invasion was negated owing to the dropping of the atomic bombs and the subsequent Japanese surrender the squadron disbanded on 15 November 1945. Two days later the squadron reformed in transport role at Lyneham, equipped with Avro Yorks, these being used during the Berlin Airlift, after which the squadron converted to the Hasting in August 1949. The squadron dropped paratroops during the Suez operation of November 1956 and in June 1959, it replaced its Hastings becoming the first unit to operate the Bristol Britannia. In June 1970, it moved its base to Brize Norton, where it remained until the withdrawal of the Britannia and its disbandment on 7 January 1976. However, in early 2002 the squadron was reformed at Brize Norton , to operate three, subsequently increased to four and later seven, Boeing C17 Globemaster IIIs. Formed on 23 February 1917 at Hingham, the squadron moved to France in March 1917 equipped with FE2bs in the night bomber role. It operated under the operational control of RFC HQ in the III Brigade area until May 1918 when it transferred to the 41st Wing in the Nancy Area. In June it became part of the Independent Air Force under the command of Sir Hugh Trenchard and continued in the strategic bombing role until the end of the war, having re-equipped with Handley Page O/400s in August. Returning to the UK in September 1939, it absorbed the cadres of No's 117 and 141 Squadrons and began operations as a Army Co-operation unit in Ireland. In early 1922 the squadron returned to the UK (Spittlegate) on the formation of the Irish Free State and soon began re-equipping with DH9As in the bomber role. Fawns arrived in 1924 and Horsleys in 1926, taking these to Donibristle in Scotland in 1930, where it converted to the Torpedo Bombing role. Vildebeests were received two years later and a year after that the squadron was sent to Singapore to re-inforce the defences of the island. Plans were made to re-equip the squadron in 1941 with Australian built Beauforts, but the Japanese attack took place before this could began and the squadron had to operate its obsolete aircraft in the face of more modern opposition. Against this kind of opposition, losses were extremely heavy and by February 1942, most of 100's aircraft were lost and the remnants were absorbed into No 36 Squadron. 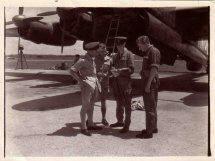 Later that year n new 100 Squadron was formed at Grimsby in No 1 Group of Bomber Command. It remained part of Bomber Command' Main Force for the remainder of the war and was retained in the post-war RAF. Lincolns were received in 1946 and some of these were used for as part of an official visit by the RAF (aircraft drawn from 83, 97 and 100 Squadrons) to Chile. 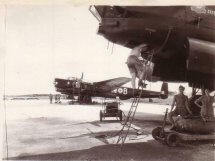 In 1950 the Squadron it began a six month detachment in Malaya as part of Operation Firedog. Another detachment took place in early 1954, this time to Kenya where it operated against the Mau Mau. Returning to the UK, the squadron began to receive the Canberra in April 1954, continuing to operate these in the bomber role until disbanding at Wittering on 1 September 1959. The squadron reformed on 1 May 1962, again at Wittering, but now equipped with the Victor B Mk 2 as part of the RAF's V-Force. It disbanded again on 30 September 1968.